In this video, you will see how to create a project and connect it with OPC UA. For more tutorials videos go to the Tutorials section or our YouTube channel. Added support of chunked messages in OPC UA. Added support for arrays and structures in OPC UA. Minor bug fixes and speed improvements. We are proud to introduce you our new member. His name is Connor Bean and he is responsible for technical support of foreign clients. Connor is Native American and he is looking forward to your questions. Contact him on: support@myscada.org. mySCADA was part of a well known Fair Trade – Amper 2017. The connection of famous Balluff company and mySCADA software brings an unique controlling system. Watching real time visualization of Bottling machine was really interesting for all visitors. If you like to have an overview what is going on, subscribe our YouTube channel or subscribe our newsletter. wizards for common scripting tasks and much more. We hope that this improvements will help you with project creation and operating with the system. Year ago the YT channel was born! A year ago, we established our YouTube channel – mySCADA Technologies. Since then, we have created almost 40 useful videos and have over 23,000 views! We would like to thank you for your support and we would appreciate it if you subscribe to our channel here! If you have any interesting topic for us, please contact us at : info@myscada.org with the subject: VIDEO TOPIC. myMOBILE has won a prestigious Engineering Award 2017! One of mySCADA´s product has won the prestigious American Award for 2017! Mobile SCADA application was chosen as the best product for its modern graphics, versatility and ability to use it independantly of place. Works on iOS and Android devices. Read more about this application here. If you are interested in our News, follow us on Facebook, Twitter, Google+, LinkedIn or subsribe our YouTube channel. We have decided to make February the month of the “SMART Apps” and we are coming up with the special offer. You can log any data or information available in mySCADA. In this video tutorial you will see how to work with data-logs in myDESIGNER. Do not forget to subscribe our YouTube channel! We would like to warmly invite you to the conference – IoT Platform Meetup. If you want to see real companies and their connection to Internet of Things, it is very recommended to come. mySCADA will present its IoT point of view and support the idea by practical example. See more about this conference here. mySCADA has an honour to introduce the new Sales Representative for Czech Republic and Slovakia – Mr. Pavel Haba. His experience and professional knowledge of Industrial Automation will be a great benefit for mySCADA team. Do not hesitate to contact him phaba@myscada.org or one of our Distributors in any trade matters. This feature is very useful for management of all tags and connections. You can start creating your project by creating the tag database and then design the visualizations afterward. Do not forget to subscribe our YouTube channel! I would like to wish you a successful new year and I am looking forward to the future cooperation. 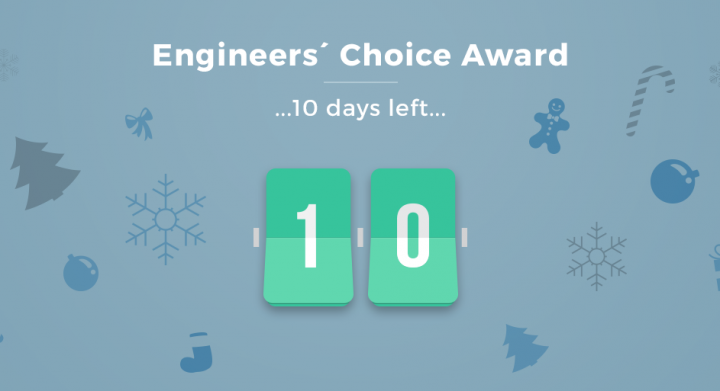 myMOBILE was chosen as a finalist of the international competition 2017 Engineers´ Choice Award. Please support us by voting for mySCADA here. If you want to know more about this smart application, watch this video (made specially for this occasion) or visit our product website. A very important feature of mySCADA is the ability to signal any dangerous or other important events with Alarms. They are an important part of most control applications as they alert operators if something goes wrong. Do not forget to subscribe our YouTube channel! This video shows how to set up 3 different types of connection – Siemens S7, ControlLogix and MODBUS. Watch and subscribe us on YouTube for more videos. mySCADA improves the creating software tool for their customers again and again. With this brand new components you can create the new project even easier than before. Use the component library and choose one of the icons right now! Instead of designing multiple similar visualizations of multiple field technology that differentiates only in operational parameters and not in appearance, you can use one master view that is common for all. Do not forget to subscribe us!